(NaturalNews) Israel's Ministry of Health has made a bold ruling against artificial water fluoridation, reversing more than 15 years of forced poisoning via public water supplies in the Middle Eastern country. A recent announcement by Israel's Supreme Court has declared that a 1974 law permitting -- and a later 1998 law requiring -- all public water supplies in Israel to be fluoridated are both outdated and invalid, and that all current fluoridation programs in the country will have to end by April 9, 2014, in order to comply with new public safety requirements. The welcomed ruling came after a petition filed last year by two dedicated individuals, including a representative of Israel's Association for Dissemination of Health Education, brought to light numerous dangers associated with water fluoridation. These include lowered IQ, brittle bones and teeth and damage to the thyroid gland, serious side effects that are hardly justified by the flimsy and antiquated arguments claiming that ingested fluoride somehow helps prevent tooth decay. The three Israeli Supreme Court justices who heard the case, along with Israeli Health Minister Yael German, took all this information to task and ultimately concluded that fluoride is, indeed, a public health threat and provides minimal, if any, health benefit to society. In his ruling, Justice D. Barak-Erez ordered the cessation of all water fluoridation programs throughout Israel by 2014, emphasizing the fact that water fluoridation is dangerous, and the science defending it is outdated and "no longer widely accepted." Any news of water fluoridation programs being scrapped, even if they are outside the U.S., is of course good news for everyone. And what this recent ruling in Israel accomplishes for the rest of the currently fluoridated world is providing further momentum for ending water fluoridation programs everywhere, especially in the U.S. where the vast majority of public water supplies are still fluoridated. "Zealous fluoridation promoters try to convince the American public that 'everyone drinks fluoridated water.' But the opposite is true," says Dr. Paul Connett, Ph.D., Executive Director of the Fluoride Action Network. "An overwhelming number of countries do not fluoridate, including 97 percent of the European population. 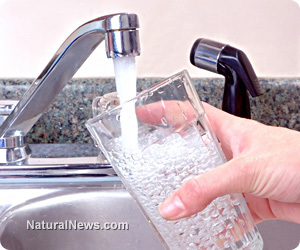 In fact, over half the people in the world drinking fluoridated water live in the U.S."
"What I find remarkable here is that Health Minister German [Israel's Health Minister] has been able to escape the unscientific belief system on fluoridation that traps so many public health bureaucracies in fluoridated countries," he adds. Fortunately, the truth about fluoride continues to spread, and towns and cities everywhere are rethinking the expensive, dangerous practice. Just within the past several months, for example, Portland, Oregon; Woodland, Washington; Wichita, Kansas, and many other towns and cities across America and throughout the world have decided to end their water fluoridation programs. Are you and your natural health allies willing to put in the necessary effort to see water fluoridation cease in your own community? "It must be known to you that fluoridation can cause harm to the health of the chronically ill," including "people who suffer from thyroid problems," wrote Israeli Health Minister Yael German in a recent letter to doctors who tried to block efforts at stopping water fluoridation in Israel.